While Diwali is celebrated all over India, a similar festival that lays emphasis on lamps — the Karthigai Deepam is celebrated in South India, notably Tamil Nadu and Kerala. The festival falls on the full moon day after Diwali, in the Tamil month of Karthigai (Nov-Dec). As a continuation of Diwali, a couple of lamps are lit every evening and placed at the doorstep till the festival of Karthigai. You can call it the Diwali of the Tamilians, and is supposed to be a very ancient one. Mention of it can be found in the oldest work of Tamil literature, the Tolkappiam, which dates back to 2500 BC. Other ancient works of literature also refer to this festival, which is celebrated over three days, in Tamil Nadu and Kerala and parts of Karnataka. According to one legend, the festival celebrates the birth of Kartikeya, the younger brother of Ganesha. And since he is considered to be the Tamil God (Murugan), it is a special festival for Tamilians. However, despite the similarities, this festival is more of a religious one compared to the social aspect of Diwali, where the emphasis is more on celebration and joy, at least in Tamil homes. Karthigai is therefore marked by fasting and prayers and the offering of laddoos (called pori urundai in Tamil), made of puffed rice and puffed poha and jaggery, along with other sweets including poha kheer and sweet appam, in the evening. While in Tamil Nadu, all houses would be lit up with rows of earthen oil lamps, only Tamilians celebrate the festival in other parts of the country. Growing up in Nagpur, it held a special flavour for me. Being the only Tamilians in the street, our house was the sole one that was lit up with rows of earthen diyas and reverberated with the sound and light of crackers. Since the cracker shops would be closed after Diwali, we would secrete away some to burst on Karthigai. Mother would make humongous quantities of the goodies which would be shared with the neighbours. The rangolis made by me and my elder sister of course would be elaborate and decorated with lamps. I would be fairly bursting with the importance of the festival. The previous evening of the festival, we go to Shiva temple and light a lamp. I follow the tradition of lighting a large one with 365 wicks tied into a bundle and dunked in oil. It is called Bharani Deepam. I love staring at its huge flame dancing in the wind. Making those wicks used to be a family affair while we were children. We used to spin the cotton into a thick yarn and make wicks out of that, counting and putting them in bundles of ten to be finally collected into a huge wick. The second day is known as the Sarvalaya Deepam, when all temples – both Shaivite and Vaishnavite – and homes come alive with hundreds of lamps, with special poojas. It is also called Shiva Karthigai. According to the legend, the glow of the lamp on the hill signifies the appearance of Lord Shiva as a huge column of fire that had no beginning or end during a debate between Brahma, Vishnu and Shiva as to which one amongst them was the greatest. While Lord Vishnu went into the earth to look for the feet, Brahma went in search of the head. Ultimately both had to accept defeat and Lord Shiva remained on earth in the form of a hill – Tiruvannamalai, as it came to be known. The entire hill is worshipped by devotees. The day after the main Karthigai is known as Vishnu Karthigai. Vaishnavaites celebrate the festival to mark the dispatching of king Bali to patala loka by Lord Vishnu in his Vaman avatar. In Tiruvannamalai, this festival is a ten day affair. On the morning of the festival, the Bharani Deepam is lit early in the morning. 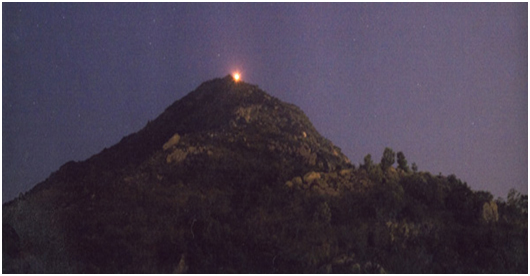 A huge lamp is lit on top of the Annamalai hill (the pic on homepage) in the evening of Sarvalaya Deepam on the second day of the festival, with the flame taken from the Bharani Deepam. The glow of this mountain-top lamp can be seen for many miles around. The lamp itself is gigantic – five and half feet high and five feet in diameter with a wick made of nearly 30 m of cotton cloth drenched in hundreds of litres of ghee. In Tamil Nadu, the temples wear a celestical look, lit with hundreds of lamps. There is also the custom of lighting a bonfire called the chokkapanai on the eve of this festival with dried palm leaves in the temples and homes, symbolising the destroying of evil. One of the legends pertaining to the festival says that this was the day when Kartikeya, the younger brother of Ganesh was born out of the sparks from Lord Shiva’s eyes. And he being the Tamil God, it is a big festival in the state. No matter what the legend, the fact remains that it is another festival of lights and lights are close to my heart as they hold deep spiritual significance at one level and dispel darkness in the practical sense. And who doesn’t like rows of oil-wick lamps adorning the house, glowing like so many stars? The festival starts tomorrow. Other festivals on Kartik Poornima: It is celebrated as Dev.Diwali in north India and it is considered auspicious to take a dip in the holy Ganga on this day. the ghats at Varanasi are lit up with thousands of lamps to welcome the Gods. For the Jains, this is an important day as the first Tirthankar Lord Adinath delivered his first sermon on the Shatrunjay Hills in Gujarat. The Sikhs celebrate Guru Nanak Jayanti today. Wish you all a very Happy Karthigai Deepam! I love the birthing of Kartikeya out of sparks from Shiva’s eyes! And I love your description of the oil lamp in Shiva’s temple and how you would all make the wicks. We have the Karthigai lamp lighting tradition at home on all three days as well, and I never fail. You’re right about the oil lamps being a must rather than candles. My family tradition was to light two elephant lamps for brothers, apart from the rows of diyas. And of course the pori laddoos and yummy banana appams. It was interesting that there were lots of rice and jaggery based offerings including a mix of cheera (aval) and jaggery that was poured into cone shaped moulds to set(mom used steel glasses) and which we would delight in breaking off and eating when the puja was done! I am so happy that i am not late in wishing you a very happy Karthigai Deepam,may God bless you all.I had never heard of this festival but i do know that Kattak Purnima is special–in fact the whole month of Kattak is supposed to be very auspicious.From North to South,the same days for reverence & celebration;but observed in different ways.Whereas in the North electric lights have taken over earthen lamps i do hope this is not so in South.The earthen lamps belong to a different class altogether.The whole Tamil Nadu must be aglitter today !!!!!!!! Oh you were not late Indu, but I am sorry the comment had to be retrieved from the spam folder. Sometimes WP goes crazy. I am hearing of Kattak Purnima for the first time. Where do they have that name for Kartik? As for earthen diyas, while candles and other lighting are ok for Diwali, oil lamps are preferred for this festival because it has more religious than social significance. At least in my house, I do it this way. Lamps also burn inside the house in all the rooms. Beautiful post! Could picture every word written, especially the bright flame glowing from the huge lamp at Annamalai hill is pure magic! As I pointed out to another commenter, we have so many festivals that are celebrated differently in different regions. I would love to see Dev Diwali in Varanasi. The sight must be absolutely wonderful. Karthigai is more of a religious festival and Tamil specific, which is why you wouldn’t have heard of it. The pic I have used is from Anu’s blog post of the festival last year. Happy Karthigai to you aunty! I am so glad you wrote this post and dispelled all the stupid myths in my mind. I always thought it was strange that Tamilians celebrated Diwali after everyone was long done with theirs! But I guess, you guys are lucky to celebrate two Diwali like festivals back to back! It was great to learn about the customs and celebrations and actually know what this festival signifies to Tamilians. Thanks for sharing. Your posts are simplistic and I njoy reading each one of them….Keep writing!!! Isn’t that wonderful? I mean it always makes me feel good when I find someone has been reading my posts and liking them too 🙂 Do you also have a blog? I’d love to visit you! Oh Dimplebarnes, I am hardly qualified to give any classes in blog writing 🙂 But all you have to do to begin writing is to expand on the words you write on greetings, with some thoughts thrown in and hey presto! you have a small feature and before you know it, you have begun writing! Thank you so much for this lovely and detailed post about Karthikai deepam. You have written it so wonderfully and intricately and it brought back so many childhood memories as we celebrated this festival with so much fervor. A very very happy Karthigai deepam to you! Karthigai Deepam seems like a wonderful festival. You just have so many interesting festivals across India, don’t you! lovely post, as usual, Zephyr! we really missed the celebrations this year, esp since i love drawing the kolam and lighting every lamp we have in the house! as for pori urundai, i am not very fond of them, but samhith is… and he is happy because everyone in our building have given him some, because we cant make it this year 😀 btw, apparently, karthikai is even celebrated in Kolhapur… at the panchaganga ghat, the whole place is apparently lit up with lamps! have to go there to see that someday! I am so sorry to hear that, Anu. Such years are really dark, but wonderful neighbours always rise to the occasion when kids are there. I have a guzzler of the urundais at home too, only the age is different 😀 I would love to hear about the celebrations at Kolhapur. Do remember to share anything you find out about it. Wonderful to learn more about Karthigai. Happy Karthigai to you too Rama. It is always nice to know the legends and the reasons behind festivals, isn’t it? For me Karthigai begins with the lamps and ends with the poojai and of course the offerings — whichever I can comfortably make 🙂 Happy Karthigai. You are not late since we have it today too. 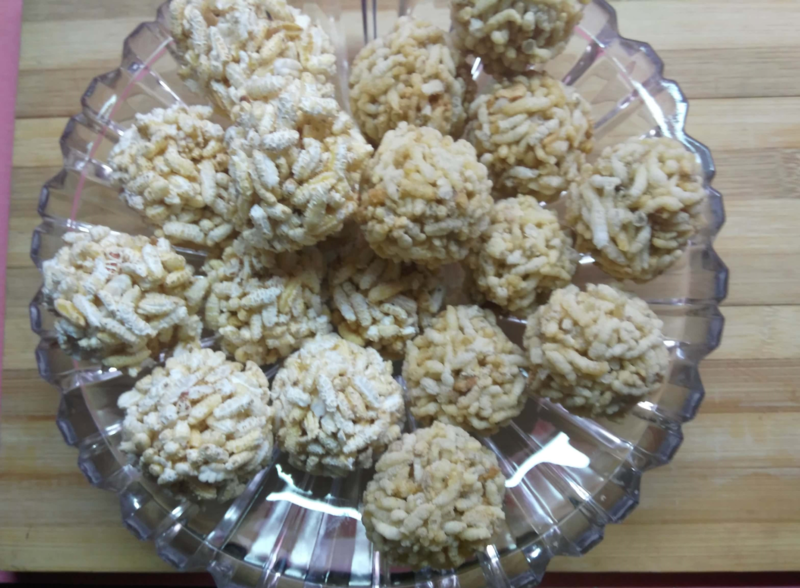 We Bengalis also celebrate Karthik purnima and, I believe, we also make the puffed rice and jaggery balls…we call them mowa! ha ha! I think the inheritance of the culinary skills have, sadly, been stopped after my mother’s generation! Happy Karthigai deepam to you. Nice to see you passion for festivals. I am not personally too excited about them as such, especially the ones that do no get me a day off from work. But my mother just loved them. And my wife in spite of her hectic schedule and lack of knowledge of Tamil traditions, still tries her best to revive all the traditions by looking up stuff on the internet. Thanks Karthik. Enthusiasm for me is only as much as my health can take, but whatever little I do, I do with gusto 🙂 Girls these days are doing a commendable job trying to keep the traditions alive by doing things in their own way, which is what festivals are all about, aren’t they? Like R’s Mom making the urundais earlier to save time. As I had said in my post on Rituals being a pain, if we modify the festivals, we can enjoy them and still keep traditions alive for future generations. Thank you so much for this post. I had heard about this festival, but didn’t know much about the way it is celebrated or the history behind it. 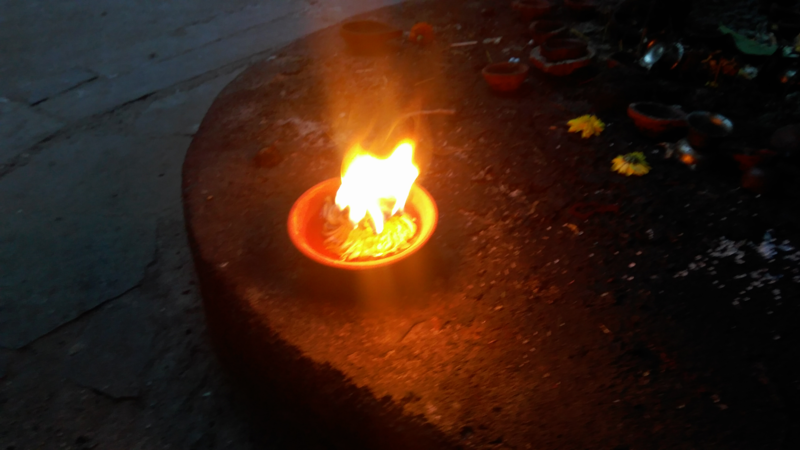 Back home in Ahmedabad, we used to celebrate Dev Diwali or Chhoti Diwali, which is something similar to Karthigai. Have heard a lot about the Karthigai deepam at Thiruvannamalai. Have heard that it is the first temple to light the deepam every year, and other temples and homes follow suit. Not sure how far that is true, though. Thank you, GND! I had done this post a couple of years ago, but it had been very sketchy. So I added a lot of info and reposted it again this year 🙂 you are right about the lamp being lit first in Tiruvannamalai, but since I had only heard about it and didn’t find mention in the official site, I didn’t mention it. It is a more sedate festival compared to Diwali but one I love a lot. Lovely description of a festival so dear to Tamizh people. I remember the lights in homes in Tamih nadu, and in the temples. Lovely sights. Since I came to live in Bangalore, I’ve noticed this festival. Yesterday, I saw rows of oil lamps outside Tamilian houses. I asked one uncle what the celebration was, and he explained a bit about it. It is fascinating to imbibe the joy of celebration. I am a sucker for oil lamps. I can watch their flickering flames for hours. Wish you belated Happy Karthigai. I made them early because wont get time on week days..
@Grond: You are right, Dev Devali usually comes along with Karthikgayi though may not exactly fall on the same day..Dev Devali is usually celebrated by the Jains in Gujarat…We used to have fun bursting crackers along with the Gujjus 🙂 and we didnt feel out of place because everyone in Baroda celebrated it eh? Karthigai Deepam has too many legends associated with it. Maybe one of them has some association with brothers and sisters. If you know more about it, do share it here, will you? Never heard of this festival before. This was a very enriching post for me. Glad you liked it Amit and discovered a new festival celebrated in other parts of the country 🙂 Thanks for the wishes and wish you the same too. i too love this day .. mom used to go for the girivalam, we kids used to arrange all the lamps on the balcony parapet. we used make sure that it keep putting oil in it once in a while. we did have tough time cleaning the spilled oil and the leak from the earthen lamps.. :). missing all that in vizag now.. ppl have started using these smalls bulbs instead of lamps. and floor conscious me, started using cup candles in the earthen diya’s :). Girivalam! It is on my bucket list and I hope I will be able to do it one day and get to see the Annamalai deepam too! Do you know? the best way to prevent spillage in lamps is to use the central wick. It burns more steadily too and oil doesn’t drip. Only the wick has to be a little long so that the flame is visible above the rim. Tea candles do sound a great idea and there is less mess too. And you are right, unlike Diwali, it is windy during karthigai and the lamps keep going off! And do you make the pori urundai? Is it exactly a fortnight after Diwali? That’s when we have what in Gujjus is called Dev-Diwali and I’ve heard some people from North India call it Chhoti Diwali. In some Gujju families, this festival has more importance than Diwali itself – I’ve not been able yet to find out why. It’s considered an auspicious day in the western parts of India (Actually, which Purnima is not?) and hence you find that a lot of weddings take place on this day. I see many people mention Dev Diwali. It is nice to be able to learn about other festivals, isn’t it? From what you mention about this festival being more important than Diwali, it looks like the latter festival somehow has assumed importance as a national festival while the regional festivals continue to remain in vogue. Actually, Diwali does not have that much importance in a Gujju’s pantheon – the next day, the Hindu New Year, is more important. Laxmi Pujan et al. are ceremonies carried out. Chopda Pujan is worshipping the books that will then hold the accounts in the coming financial year. Oh – and if I’m correct – today is Karthigai no? Best Wishes! Didn’t know about this before..
Belated Karthigai wishes to you. It is wonderful to learn of so many customs across India, which we otherwise might have never known! Thank you for the Karthigai wishes. That sounds great. How ’bout sending me some pics of you lighting the lamps in a sari? that would be a double treat for me, wouldn’t it? What about pori urundais? Look at the ulta chor kotwal ko date… you did the vanishing trick and asking me where I was? hmmph.. Welcome here Pooja. In some way or the other the various cultures of this wonderful country is united in its celebrations and vrats, isn’t it? Karthik Poornima is also known as Deva Deepawali. In Karnataka too the whole month lamps are kept around the temples. At homes too a big lamp will be kept on most evenings and especially on Poornima. And on that day there will be a sumptuous feast in the temple. The info about the lamp was interesting…Happy Karthigai puja to you and family! Keep discovering new customs, festivals. Happy Karthigai to you and your L&M. Happy wishes for eco-friendly karthigai celebration! HAPPY KARTHIGAI TO YOU AND YOURS!! Thank you magiceye. I am just about to light the lamps before starting the pooja.